There are 2,000 or more kinds of wild mushrooms in Ohio. Some are poisonous, and some are edible and delicious when properly prepared. The edibility of the majority is either not known or they are not considered for food because of their small size or poor flavor or texture. Even though not everyone is interested in collecting mushrooms to eat, it is important to understand most have an important and beneficial role in the environment. They grow in a wide variety of habitats. Most of the mushrooms seen on a walk through a woods are beneficial. Many species are quite specific about their food source and will be found only under or near certain kinds of trees — some under pines, others under oak, etc. Some are important as decay organisms, aiding in the breakdown of logs, leaves, stems and other organic debris. This important role of mushrooms results in recycling of essential nutrients. Some mushrooms grow in and form their fruiting structures on living trees, causing decay of the sapwood or of the heartwood. Many woodland mushrooms are essential to good growth and survival of trees. They establish a relationship with roots of living trees that is mutually beneficial. These are called mycorrhizal mushrooms. All mushrooms, whether poisonous or edible can be admired for their beauty and their fantastic variety of form, color and texture. Which Mushrooms Are Safe to Eat? Some edible mushrooms are very similar in appearance to poisonous kinds and may grow in the same habitat. Edible mushrooms are known to be safe to eat because they have been eaten frequently with no ill effects. Poisonous mushrooms are known because someone ate them and became ill or died. There is no test or characteristic to distinguish edible from poisonous mushrooms. This indicates a need to identify with certainty one of several of the proven edible species and pick and eat only those positively identified. At the same time, you should also learn to identify some of the common poisonous mushrooms, especially those that are similar to edible kinds. It is especially important to learn the characteristics of the Amanita mushrooms, since several of the species common in Ohio are poisonous and a few cause serious illness and sometimes death. The word toadstool is often used to indicate a poisonous mushroom. Since there is no way to distinguish between a so-called toadstool and an edible mushroom, it is more precise to speak of poisonous or edible mushrooms. The season for collecting wild mushrooms in Ohio for food begins in late March and early April when the first morel or sponge mushrooms are found. These choice edible mushrooms are most abundant during April and the first two weeks of May. The false morels (members of the Gyromitra genus) are found at this same time of the year, but they must be regarded as poisonous and not collected for eating. It is true that many have eaten false morels with no apparent ill effects. However, recent research has shown toxins to be present in some of the false morels that can cause death or serious illness. Do not eat the false morels. From mid-summer to late autumn, a great variety of mushrooms may be found in Ohio. A number of these are choice edibles. 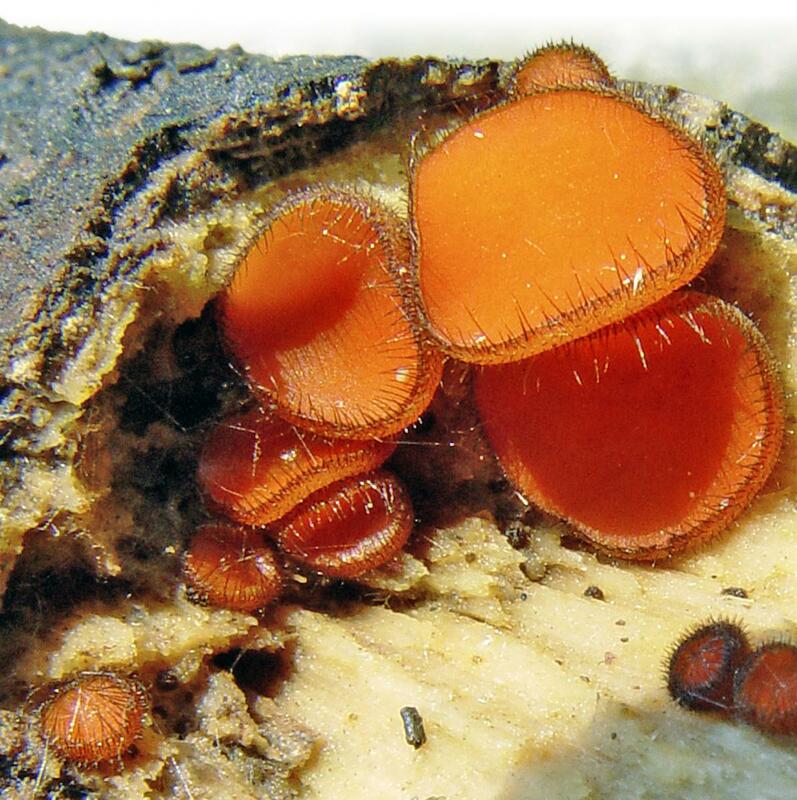 Photographs and brief descriptions of several of the more common mushrooms found in Ohio are included in this fact sheet and in the book Mushrooms and Macrofungi of Ohio and the Midwestern States. Eat only a small amount the first time; even morels, generally considered to be excellent, may cause illness in some persons. 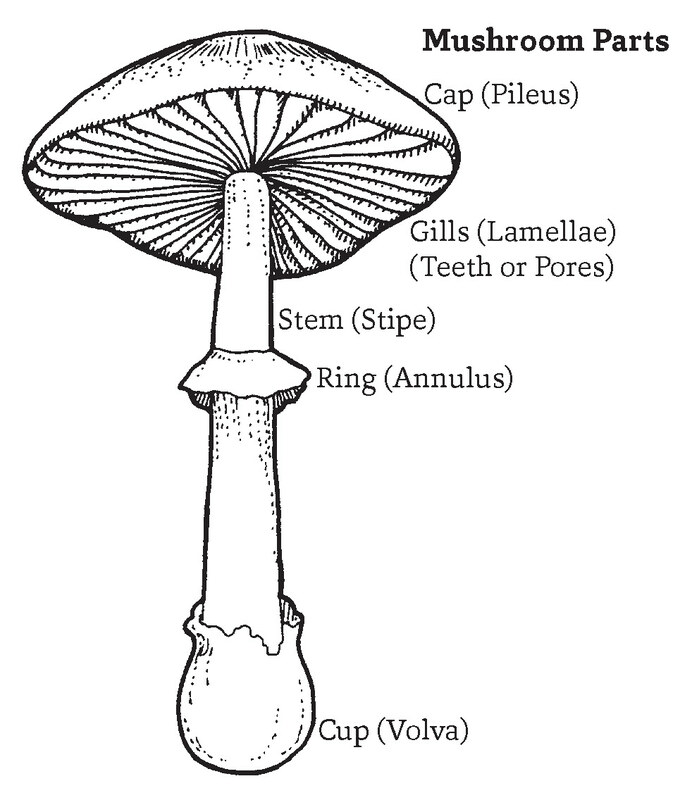 If you do eat a mushroom you've picked, save a sample. In case you become ill, the sample can be used to determine if the mushroom caused your illness. Don't experiment. There is an old saying, "There are old mushroom hunters and bold mushroom hunters, but there are no old, bold mushroom hunters." Figure 1. Chanterelle (Cantharellus) is bright yellow to orange and found from June to September under hardwood trees, especially oak, and under hemlock, which is its favorite host in Ohio. Photo courtesy of B. Bunyard. Figure 2. Giant Puffball (Calvatia) Edible. It ranges in diameter from 8 to 24 inches and is found in parks, meadows, pastures, open woods and urban areas from late August to early October. Photo courtesy of B. Bunyard. Figure 3. Shaggy mane (Coprinus). One of the inky caps. Late summer to fall in grassy areas and hard-packed ground. Edible. Gills and cap soon become inky. Photo courtesy of W. Sturgeon. Figure 4. Shaggy Parasol (Chlorophyllum rachodes). This scaly capped, edible mushroom is often found in compost, mulch and lawns, often near spruce trees. It has a white spore print. Photo courtesy of B. Bunyard. Figure 5. Fly Amanita. Reddish-orange, orange to yellow caps with whitish "warts." Poisonous. Under trees. Photo courtesy of B. Bunyard. Figure 6. Morel mushroom (Morchella). Five species in Ohio late March to mid-May. Edible. Photo courtesy of W. Sturgeon. Figure 7. Meadow mushroom (Agaricus). In grassy areas, late summer and early fall. Pink gills, becoming chocolate brown. Edible. Photo courtesy of W. Sturgeon. Figure 8. Russula mushroom (Russula sp.). Many species in Ohio of various colors: green, yellow, orange, purple, red, white, etc. All woodland and mycorrhizal. Some edible and some poisonous. Summer and fall. Brittle in texture, especially the gills. Photo courtesy of W. Sturgeon. Figure 9. 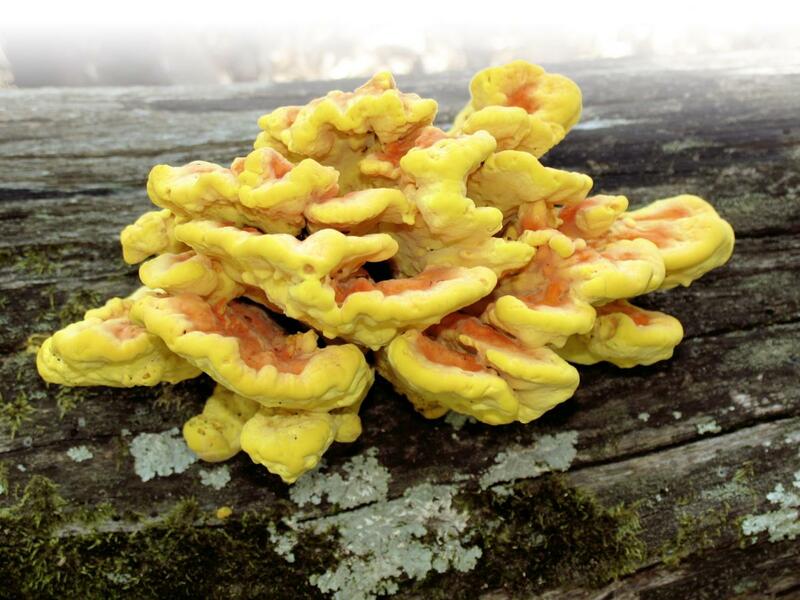 Sulfur or Chicken mushroom (Laetiporus). Orange-yellow with pores. On wood. Edible, especially the tender edges. Summer and fall. Photo courtesy of J. Justice. Figure 10. False morels (Gyromitra sp.). Note the conical-shaped true morels versus the false morels. Do not eat false morels. April and May. Photo courtesy of B. Bunyard. Figure 11. Jack-O-Lantern mushroom. (Omphalotus, Clitocybe). Orange-yellow with gills. Base of stumps, decaying tree roots. Poisonous. Photo courtesy of W. Sturgeon. Figure 12. 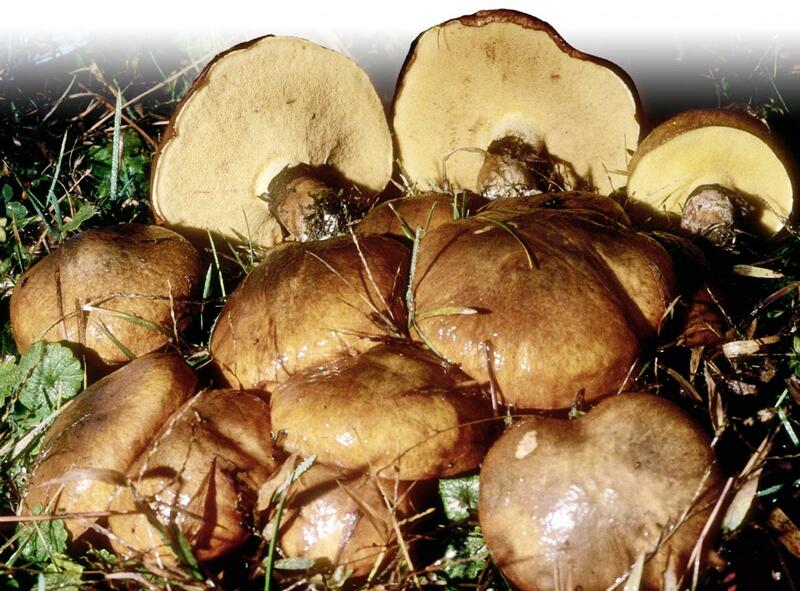 Slippery jack (Suillus, Boletus). A fleshy pore mushroom. Under 2- and 3-needle pines. Edible. Photo courtesy of W. Sturgeon. Figure 13. Smooth white Lepiota. Grassy areas, late summer to early autumn. Edible for most people. Be aware of look-a-likes. Photo courtesy of B. Bunyard. Figure 14. Destroying Angel (Amanita sp.). Three, all white similar species, common in Ohio in mixed woods. Found July to October. Poisonous, deadly. Photo courtesy of B. Bunyard. Figure 15. Eyelash cup. Grows on wood. Dark hairs line the edges of the cup. Photo courtesy of B. Bunyard. Figure 16. Green-Spored Lepiota. Often appears in large fairy rings in lawns. Poisonous. Photo courtesy of B. Bunyard. Figure 17. Lactarius or milk mushroom. One of many woodland species. Some edible, some not. All are mycorrhizal. A latex (white or colored) exudes from injured areas. Summer and fall. Photo courtesy of B. Bunyard. Figure 18. Common brown cup mushroom (Peziza). Photo courtesy of W. Sturgeon. Audubon Society Field Guide to North American Mushrooms by Gary Lincoff. Alfred A. Knopf. 926 p. 756 color photographs with descriptions of all species. Field Guide to Mushrooms of North America by Kent and Vera McKnight. 429 p. and 48 pl. (A Peterson guide) Houghton Mifflin Co. 500 species described and illustrated in color. Another 500 discussed. Mushrooms and Macrofungi of Ohio and the Midwestern States: A Resource Handbook by L.H. Rhodes, B.A. Bunyard, W.E. Sturgeon and S.D. Ellis Williams. The Ohio State University. Color photographs, 140 mushrooms. Mushrooms of North America by O.K. Miler. E.P. Dutton and Co. Over 400 species described; 292 color photographs; illustrated glossary. The Mushroom Hunter's Field Guide by A.H. Smith and Nancy Weber. Univ. of Mich Press. 316 p. and 282 color photographs. The authors of the above guides are professional mycologists. These guides are often available online, in local bookstores or in public libraries. Contact the above for more information. The membership dues are nominal. Newsletters are issued several times a year, and field trips, forays and workshops are scheduled. These clubs are for anyone interested in any aspect of mushrooms. Both have professional mycologists to help identify mushrooms and lead field trips. This fact sheet is a revision of the original, written in 1996 by C. Wayne Ellett, Emeritus Professor, Department of Plant Pathology, The Ohio State University.